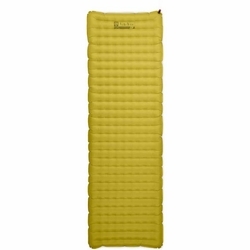 NEMO Tensor Insulated Sleeping Pad. Tensor™ Insulated features NEMO’s lightest weight fabrics and cutting edge insulation. Constructed with low-stretch fabric baffles to eliminate elasticity, Tensor’s height, stability, quiet fabrics, paltry weight, and packed size make it the ultimate in ultralight pad design. Thermal mirror™ aluminized film reflects radiant heat to offer insulation at an ethereal weight, in conjunction with Primaloft© insulation you're sure to stay warm. Dump valve included on 25R and 25L only for faster deflation.